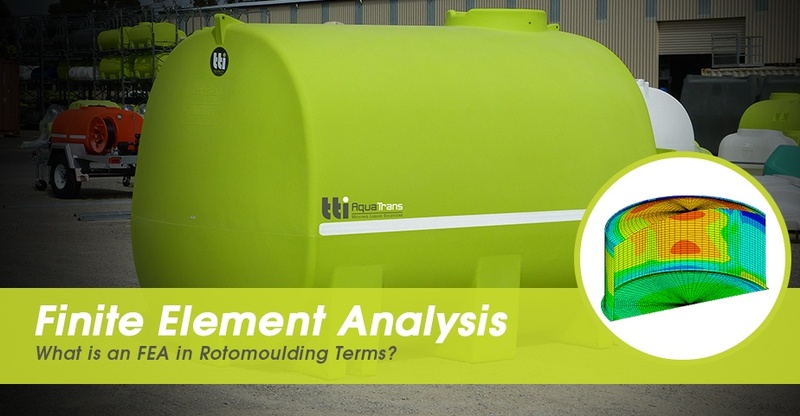 What is an FEA in Rotomoulding Terms? What does FEA stand for, and why is it relevant to your TTi products? Simply, Finite Element Analysis (FEA) ensures that your product is fit for its purpose. FEA is a computer based method of predicting the performance of geometrically complex structures, including rotomoulded products. This allows for computer prediction of the performance of the product or structure, and can also be used to solve performance problems with existing products. FEA is widely accepted across engineering disciplines, and is most commonly used as a substitute for experimental testing. 3. Post-processing – results are obtained in the form of deformed shapes or contour plots, which help to check the validity of the solution. FEA is particularly suitable for structural and mechanical engineering design, product development, manufacturing processes, improving the efficiency of existing designs and failure analysis investigations, providing information about strains and stresses, deformation and natural frequencies. FEA enables engineers to achieve objectives they might not otherwise be able to, and saves time and money. It helps in the understanding of structural behaviours, which in turn helps to remove uncertainty from your product. At TTi, we have a strict process that all new products go through long before we start bending the steel to make a mould. A key part of this process is carrying out an FEA to ensure the product will meet the demands of the stresses it will be placed under when being used in the real world.